1. This is the 4th week of my training cycle and my injury is no longer bothering my running workouts. 05 Jan—-5.6K Run. I tried to do a controlled “interval/speed” run at the Oval Track. It was to test my legs and my injury. Average Pace per lap (400 meters): 4:45 minutes per kilometer. I did 5 X 400 meter runs with 1 minute rest after one lap. There was no pain with my injury. 06 Jan—-10K Tempo Run @ Oval Track with an average pace of 5:32 mpk. 3. The 4th Week of the Training Cycle is still a part of the Endurance/Base Building Phase. I have maintained a maximum mileage of 60-62 kilometers per week for the past 4 weeks and I intend to lessen my mileage for the 5th week in order to recover. 4. 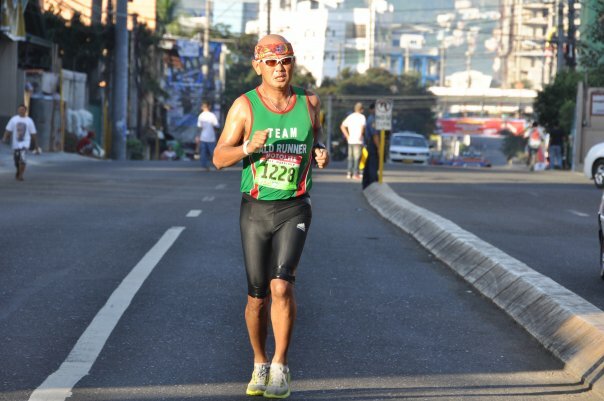 The Cebu City Half-Marathon was a “diagnostic test” to evaluate my performance level. Due to my good performance, it is time to progressively build-up my mileage for endurance and intend to go back to supplementary weight training at the Gym to strengthen my core and leg muscles. 5. One of my readers asked me to make a review on the Adidas Techno Fit Compression Shorts. Well, this is what I have to write about this apparel. The “shiny” strips on my buttocks, hamstrings, and at the end of my quads (near the knees) produce a “tight” feeling to my running muscles and I could feel a “squeeze” action whenever I lift my legs. The “squeeze” feeling reminds me to lift my knees some more, resulting to a longer stride. I am basically a “shuffler” (not lifting the knees) but when I wear this shorts, it forces me to lift my knees higher. Aside from this reason, it also prevents the upper leg muscles from injuries. The price is P 3,400+ and it is worth the price.